as second Mukhtiyar of Nepal and de facto first Prime Minister. The Prime Minister of Nepal (Nepali : नेपालको प्रधानमन्त्री) is the leader of the executive body (i.e. the Government of Nepal). The prime minister is the head of the Council of Ministers of Nepal. He/she should be member of the House of the Representative Pratinidhi Sabha. The prime minister is the senior-most member of cabinet in the executive of government in a parliamentary system. The prime minister selects and can dismiss members of the cabinet; allocates posts to members within the government; and is the presiding member and chairperson of the cabinet. Nepali, known by the endonym Khas Kura also known as Gorkhali or Parbatiya, is an Indo-Aryan language of the sub-branch of Eastern Pahari. It is the official language of Nepal and one of the official status gained language of India. It is spoken mainly in Nepal and by about a quarter of the population in Bhutan. In India, Nepali is listed in the Eighth Schedule to the Constitution as an Indian language, with official status in the state of Sikkim, and spoken in Northeast Indian states such as Assam and in West Bengal's Darjeeling district. It is also spoken in Burma and by the Nepali diaspora worldwide. Nepali developed in proximity to a number of Indo-Aryan languages, most notably the other Pahari languages and Maithili, and shows Sanskrit influence. However, owing to Nepal's location, it has also been influenced by Tibeto-Burman languages. Nepali is mainly differentiated from Central Pahari, both in grammar and vocabulary, by Tibeto-Burman idioms owing to close contact with this language group. The Council of Ministers or Federal Executive exercises authority over the Federal Government of Nepal. The Prime Minister is the head of the Council of Ministers. The incumbent Prime Minister is Khadga Prasad Oli. The federal cabinet headed by the prime minister is appointed by the President of Nepal to assist the latter in the administration of the affairs of the executive. The prime minister has to enjoy the confidence of a majority in the Pratinidhi Sabha and shall resign if they are unable to prove majority when instructed by the president. The President of the Federal Democratic Republic of Nepal is the head of state of Nepal and commander in chief of the Nepalese Armed Forces. The office was created in May 2008 after the country was declared as a republic. The first President of Nepal was Ram Baran Yadav. The current president is Bidhya Devi Bhandari, elected in October 2015. She is the first female Nepali head of state. The President is to be formally addressed as "The Right Honourable". The residence of Prime Minister of Nepal is in Baluwatar, Kathmandu. The seat of the Prime Minister is Singha Darbar since the time of Chandra Shamsher Jang Bahadur Rana. The basic monthly salary of Prime Minister of Nepal is NPR 77,280. The Prime Minister of Nepal does not have a term limit. Baluwatar is a residential area of Kathmandu, the capital city of Nepal on the banks of Bagmati River. It is just 15 minutes away from what is known as the downtown of Kathmandu, New Road and Ason and shares borders with Lazimpat and Gairidhara. Baluwatar hosts the Prime Minister of Nepal's official residence, government offices, Nepal Rastra Bank's headquarters, the Nepalese country headquarter of the International Organization for Migration the Russian Embassy and the office of Volunteer Service and Support Nepal (VSSN) are located here. Singha Durbar is a palace in Kathmandu, the capital of Nepal. The palace complex lies in the centre of Kathmandu, to the north of the Babar Mahal and Thapathali Durbar and east of Bhadrakali. This palace was built by Chandra Shumsher JBR in June 1908. The palace used to be one of the most exquisite and lavish of palaces in the world until the 1950s. The position of Prime Minister of Nepal (Nepali : नेपालको प्रधानमन्त्री; Nēpālakō pradhānamantrī) in modern form was called by different names at different times of Nepalese history. At the time of the Shah dynasty, either Chautariya, Kaji or Mulkajis (Chief Kajis) served the function of Prime Ministers. In 1806, the position of Mukhtiyar was created by Rana Bahadur Shah which carried executive powers of nation. Mukhtiyar is formed from two words: Mukhya and Akhtiyar. Mukhya means Chief  and Akhtiyar means Authority. Altogether it means the "Executive Head of the State". Mukhtiyar held the position of Executive Head till adoption of title of Prime Minister on 1843 A.D. The first Mukhtiyar to title himself as Prime Minister, as per the British convention, was the last Mukhtiyar Mathabar Singh Thapa. Mathabar Singh became Mukhtiyar as well as Prime Minister and Commander-In-Chief of the Nepalese army in November 1843  by the declaration of second queen of Rajendra, Queen Rajya Laxmi Devi. [note 1] During the Rana dynasty, the position of Prime Minister was hereditary and the officeholder held additional titles — Maharaja of Lambjang and Kaski, Supreme Commander-in-Chief of Nepal and Grand Master of the Royal Orders of Nepal. The history of Nepal is intertwined with the history of the broader Indian subcontinent and the surrounding regions, comprising the areas of South Asia and East Asia. Shah dynasty was the ruling Chaubise Thakuri dynasty from the Indian subcontinent; they claimed Rajput origin from medieval India, and derived from the Gorkha Kingdom from 1559 to 1768 and later the unified Kingdom of Nepal from 1768 to 28 May 2008. Mulkaji was the position of head of executive of Kingdom of Nepal in the late 18th and early 19th centuries. It was equivalent to Prime Minister of Nepal. There were 5 Mulkajis appointed between 1785 and 1804. Mukhtiyar was the position of head of executive of Kingdom of Nepal between 1806 and 1843. It was equivalent to Prime Minister of Nepal. There were 7 Mukhtiyars appointed between 1806 and 1843. Bhimsen Thapalisten (help·info) was the Mukhtiyar and de facto ruler of Nepal from 1806 to 1837. Bhimsen Thapa ruled for 31 years as Mukhtiyar and implemented large number of reforms in agriculture, forestry, trade and commerce, judiciary, military, communications, transportations, slavery, human trafficking and other social evils in his premiership. During Bhimsen's prime ministership, the Gurkha empire had reached its greatest expanse from Sutlej river in the west to the Teesta river in the east. However, Nepal entered into a disastrous Anglo-Nepalese War with the East India Company lasting from 1814–16, which was concluded with the Treaty of Sugauli, by which Nepal lost almost one-third of its land. It also led to the establishment of a permanent British Residency. The death of King Girvan Yuddha Bikram Shah in 1816 before his maturity, and the immature age of his heir, King Rajendra Bikram Shah, coupled with the support from Queen Tripurasundari (the junior queen of Rana Bahadur Shah) allowed him to continue to remain in power even after Nepal's defeat in the Anglo-Nepalese War. The Rana regime founded by Jung Bahadur Rana began an autocratic and totalitarian rule. Few of Nepalese Prime Ministers have carried a democratic mandate. The first elected Prime Minister was Bishweshwar Prasad Koirala, in 1959. After he was deposed and imprisoned in 1960, the King established the Panchayat system and Nepal did not have a democratic government until 1990, when the country became a constitutional monarchy after the Jana Andolan movement. The monarchy was abolished on 28 May 2008 by the 1st Constituent Assembly. 1. The President shall appoint the parliamentary party leader of the political party with the majority in the House of Representatives as a Prime Minister, and a Council of Ministers shall be formed in his/her chairmanship. 2. If there is not a clear majority of any party according to clause (1), the President shall appoint as Prime Minister the member of the House of Representatives who can have the majority with the support of two or more political parties represented in the House of Representatives. 3. If there is a situation wherein it is not possible to make the appointment of the Prime Minister as provided for in clause (2) within 30 days of the final result of the election of the House of Representatives, or if the appointed Prime Minister, as provided for in clause (4), fails to receive a vote of confidence, the President shall appoint the leader of the party with the highest number of members in the House of Representatives as the Prime Minister. 4. The Prime Minister appointed according to clause (2) or (3) shall have to receive the vote of confidence of the House of Representatives within 30 days of his/her appointment. 5. If a Prime Minister appointed according to clause (3) fails to receive a vote of confidence pursuant to clause (4), the President shall appoint a member as Prime Minister, who produces bases that he/she may win the vote of confidence of the House of Representatives as provided for in clause (2). 6. The Prime Minister appointed according to clause (5) shall have to get the vote of confidence according to clause (4). 7. If the Prime Minister appointed according to clause (5) fails to get the vote of confidence or if any member fails to be appointed as Prime Minister, the President shall, on the recommendation of Prime Minister, dissolve the House of Representatives and fix a date to conduct another election within six months. 8. The procedure regarding the appointment of the Prime Minister shall have to be completed within 55 days after the post of the Prime Minister falls vacant, or the announcement of the final results of the election of the House of Representatives according to this Constitution. 9. The President shall, on the recommendation of the Prime Minister, form a council of ministers consisting of members not exceeding twenty-five in number from among the members of the Federal Parliament on the basis of the principle of inclusion. 10. The Prime Minister and the ministers shall be collectively accountable to the Federal Parliament, and, a minister shall be personally accountable to the Prime Minister for the works of his/her ministry, and also to the Federal Parliament. 1. The executive power of Nepal shall rest with the Council of Ministers in accordance with this Constitution and law. 2. The responsibility of providing general directives, control and enforcement regarding the governance system of Nepal, by adhering to this constitution and law, shall rest with the Council of Ministers. 3. The entire works relating to the federal executive of Nepal shall be done in the name of the Government of Nepal. 4. The decision or Order and related certification of credentials as provided for by clause (3) shall be done according to law. If the Prime Minister ceases to hold the office according to clause (1), the same council of ministers shall continue to work until another council of ministers is constituted. Provided that, in the case of the death of the Prime Minister, the senior most minister shall continue to act as Prime Minister until a new Prime Minister is appointed. Rana dynasty is a Kshatriya (Rajput-Chhetri) dynasty from the Indian subcontinent that ruled the Kingdom of Nepal from 1846 A.D until 1951 A.D, reducing the Shah monarch to a figurehead and making Prime Minister and other government positions hereditary. This changed in 1951 with the promulgation of a new constitution, when power shifted back to the monarchy of King Tribhuvan. Rana dynasty were descended from Kunwar family, a nobility of Gorkha Kingdom. Due to the marital lineages with the politically reigning Thapa dynasty from early 19th century, Ranas gained entry to central Darbar politics. Ranas were also linked to the minor faction of another politically acclaimed Pande dynasty of Gorkha through Thapa dynasty. Damodar Pande was the Mulkazi of Nepal from 1803 to 1804 and most influential Kaji since 1794 to his death on March 13, 1804. He was the youngest son of famous Kaji of Prithivi Narayan Shah Kalu Pande. He was born in 1752 in Gorkha. Damodar Pande was one of the commanders during the Sino-Nepalese War and in Nepal-Tibet War. And he was among successful Gorkhali warriors sent towards the east by Prithivinarayan Shah. Mathabar Singh Thapalisten (help·info), also spelled Mathbar, Mathawar, Mathavar, variantly called Matabar Singh Thapa, was the Prime Minister of Nepal and the Commander-In-Chief of the Nepalese Army from 1843 December 25 – 1845 May 17, until he was murdered by his nephew Jung Bahadur Rana. He was the first Mukhtiyar to title himself as a Prime Minister, as per the British convention. He was the nephew of Bhimsen Thapa, who was falsely sentenced for imprisonment for the death of King Rajendra's six months old son. Mathabar Singh Thapa fled to Shimla after the execution of Bhimsen Thapa, to avoid his own execution as he was Bhimsen's nephew. Four years later, the second queen of Rajendra, Queen Rajya Lakshmi, called him back and installed him as the Mukhtiyar, paving the way for him to eventually title himself as the Prime Minister.. Mathabar Singh, however, enraged the queen by refusing to make her son, Ranendra Bikram, the king. The queen, in turn, had him shot by his own nephew Janga Bahadur Rana and thereby making him the last dynast of the Thapa dynasty. Kaji was a title and position used by nobility of Gorkha Kingdom (1559–1768) and Kingdom of Nepal between 1768–1804. Many other contemporary kingdoms used the same title for their ministers. 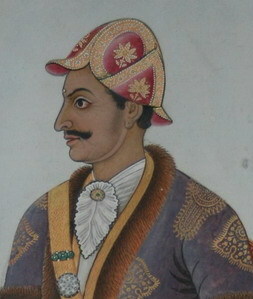 Bal Narsingh Kunwar or Balanarsingh Kanwar was a Nepalese Kaji and Governor of Dhankuta, Dadeldhura and Jumla. He was the father of Jung Bahadur Rana, founder of the Rana dynasty. Bal Narsingh married Ganesh Kumari, daughter of Thapa Kaji Nain Singh Thapa and was related to Pandes through his mother-in-law Rana Kumari Pande, daughter of Mulkazi Ranajit Pande. Ranga Nath Poudyal popularly known as Ranganath Pandit was the Mukhtiyar of Nepal from 1837 December to 1838 August and in 1840 November for about 2–3 weeks. He was the first Brahmin Prime Minister of Nepal. Rana Jang Pande was the 3rd Prime Minister of the government of Nepal and the most powerful person in political scenario in three decades from the aristocratic Pande clan. He was one of the sons of Mukhtiyar Kaji Damodar Pande. He served as the Prime Minister for two terms, serving 1837–1837 and 1839–1840 AD. He became powerful after Bhimsen Thapa was arrested, and was declared Mukhtiyar and Commander in Chief. He was a grandson of Kaji Kalu Pandey who was the commander of King Prithvi Narayan Shah and the Mulkaji of Gorkha and a notable figure during the unification campaign of Nepal. Nain Singh Thapa or Nayan Singh Thapa was a Nepalese Kaji (minister) and a military general. He died in the offensive campaign of Kangra from bullet injury. He was the owner of Thapathali Durbar. Bakhtawar Singh Thapa also spelled Bhaktawar, was a Nepalese military commander, politician, and governor. He acted as an aide of his brother Mukhtiyar Bhimsen Thapa and was appointed the commander of Samar Jung Company. He commanded the Bijayapur-Sindhuli Gadhi Axis in the first campaign of Anglo-Nepalese War and Makwanpur Gadhi Axis in the second campaign. Later, he became the governor of Palpa and died in the office. Amar Singh Thapa, distinguished as Sanukaji Amar Singh Thapa was a Nepalese military commander, courtier, minister and regional administrator. He was born as the youngest son of one of the leading Gorkhali Bharadar Birabhadra Thapa. He led battles against many independent principalities in Nepal and a battle against Tibet. He was a Governor of Palpa and retained the post till his death in 1814. Ranajit Pande was Nepalese politician, military personnel and courtier in the Kingdom of Nepal. He was member of the Gora Pande clan of Gorkha. He became Mulkaji of Nepal for a brief period in 1804 A.D. The Pande family or Pande dynasty was a Kshatriya (Rajput-Chhetri) political family that directly ruled Nepali administration affairs in the 19th century as Mulkaji and Mukhtiyar. This dynasty/family was one of the four noble family to be involved in active politics of Nepal together with Shah dynasty, Basnyat family and Thapa dynasty before rise of Rana dynasty. Dalbhanjan Pande or Dalabhanjan Pande was a Nepalese minister, politician and military officer of the aristocratic Pande family. He had held ministerial positions and military offices. He jointly headed the military administration of Nepal in 1837 along with Mukhtiyar Rana Jang Pande. The Bhandarkhal massacre was a political massacre that occurred in Bhandarkhal garden of Hanuman Dhoka, Kathmandu in 1806. The chief perpetrator of the massacre was then Kaji Bhimsen Thapa. Bhimsen instigated the massacre as investigation and trial upon the death of then reigning Mukhtiyar and former King Rana Bahadur Shah. It began when Tribhuvan Khawas (Pradhan), a member of Sher Bahadur's faction, was imprisoned on the re-opened charges of conspiracy with the British that led to Knox's mission and finally convicted with a death penalty on the charge of treason. After the implication, Tribhuvan decided to reveal everyone that was involved in the dialogue with the British on his house meeting on the night of 25 April 1806. The confession implicated Sher Bahadur Shah, Rana Bahadur's step-brother and he began to harass his stepbrother. Unable to bear desperation, Sher Bahadur killed Rana Bahadur and triggered the massacre which lasted for two weeks. The number of deaths occurred was ninety-three people. ↑ Bharadar translates as 'bearers of burden of state'. ↑ Here the government of Nepal can simply be called Bharadari Sabha or Council of Bharadars. 1 2 "PM Deuba shifts to official residence in Baluwatar". thehimalayantimes.com. 19 June 2017. Retrieved 26 March 2018. 1 2 "How much are VIPs, including President and PM, paid monthly?". thehimalayantimes.com. 20 July 2016. Retrieved 26 March 2018. ↑ "Baluwatar vacated - The Himalayan Times". thehimalayantimes.com. 14 October 2015. Retrieved 26 March 2018. ↑ "PM's Office - Heritage Tale - ECSNEPAL - The Nepali Way". ecs.com.np. Retrieved 26 March 2018. ↑ "Left alliance urges President to appoint UML Chair Oli as prime minister". thehimalayantimes.com. 15 February 2018. Retrieved 26 March 2018. ↑ Nepal, Gyanmani (2007). Nepal ko Mahabharat (in Nepali) (3rd ed.). Kathmandu: Sajha. p. 314. ISBN 9789993325857. ↑ "English Translation of "मुख्य" - Collins Hindi-English Dictionary". www.collinsdictionary.com. Retrieved 26 March 2018. ↑ "English Translation of "अख़्तियार" - Collins Hindi-English Dictionary". www.collinsdictionary.com. Retrieved 26 March 2018. 1 2 3 Kandel, Devi Prasad (2011). Pre-Rana Administrative System. Chitwan: Siddhababa Offset Press. p. 95. ↑ Regmi 1971, p. 17. ↑ Regmi 1971, p. 18. ↑ Regmi 1971, p. 24. ↑ Regmi 1971, p. 6. 1 2 3 4 5 6 Pradhan 2012, p. 8. ↑ Pahari 1995, p. 632. ↑ Raj 1996, p. 5. 1 2 3 Pradhan 2012, p. 9. ↑ Acharya 2012, p. 14. 1 2 3 4 5 6 Pradhan 2012, p. 12. ↑ Karmacharya 2005, p. 56. ↑ Acharya 2012, p. 34. ↑ Acharya 2012, p. 35. ↑ Nepal 2007, p. 51; Amatya 1978; Acharya 2012, pp. 35–36. ↑ Acharya 2012, pp. 36–37. 1 2 Karmacharya 1995, p. 64. ↑ Pradhan 2012, p. 14. ↑ Acharya 2012, p. 16. ↑ Acharya 2012, pp. 16–17. ↑ Acharya 2012, pp. 17–21. ↑ Acharya 2012, pp. 26–27. 1 2 3 Acharya 2012, pp. 28–32. 1 2 Pradhan 2012, p. 13. 1 2 Acharya 2012, pp. 49–55. ↑ Nepal 2007, p. 56. ↑ Acharya 2012, pp. 54–57. ↑ Acharya 2012, p. 57. 1 2 Nepal 2007, p. 57. 1 2 Acharya 2012, p. 54. 1 2 Nepal 2007, p. 58. ↑ Acharya 2012, pp. 56,80–83. ↑ Acharya 2012, p. 55. ↑ Nepal 2007, pp. 60–61. ↑ Pradhan 2012, p. 27. 1 2 3 Nepal 2007, p. 61. 1 2 3 Acharya 2012, p. 63. ↑ Acharya 2012, pp. 64–66. ↑ Nepal 2007, p. 62. ↑ Acharya 2012, p. 67. ↑ Nepal 2007, pp. 62–63. ↑ Acharya 2012, pp. 68–71. ↑ Nepal 2007, pp. 63–64. 1 2 Acharya 2012, p. 70. ↑ Nepal 2007, p. 63. 1 2 Nepal 2007, p. 64. ↑ Karmacharya 2005, p. 86. ↑ Acharya 2012, p. 3. ↑ Acharya 2012, p. 62. 1 2 Acharya 2012, p. 71. ↑ Karmacharya 2005, p. 80. ↑ Acharya 2012, p. 163. ↑ Pradhan 2012, p. 28. ↑ Acharya 2012, p. 72. 1 2 3 4 "Constitute". www.constituteproject.org. Regmi, Mahesh Chandra (1971). Regmi Research Series (PDF). 03. Regmi Research Centre.